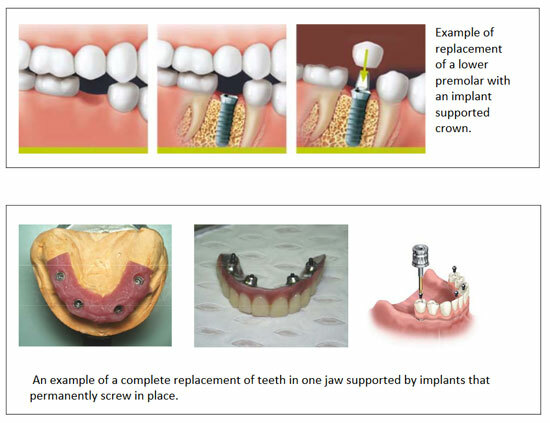 Dental implants serve to anchor replacement teeth firmly into the jaw. This can be a single tooth, multiple missing teeth or the entire dental arch. It is possible because of the discovery that titanium “integrates” into bone, i.e. it forms a biological union which is very strong. Dental implants offer the closest thing to natural tooth replacement, however, they are not appropriate in every situation. lower success rates, but do not necessarily preclude you from implant treatment. These include diabetes, previous bisphosphanate medication, smoking, and the presence of uncontrolled gum disease. several months is usually required for the implants to fully integrate, after which time the replacement teeth are connected to the implants by your dentist. As with all minor surgical procedures there is the risk of post-operative infection, and in a limited number of cases the implant may fail to integrate. If this occurs it is generally possible to undertake a repeat procedure successfully. There are numerous published research studies confirming the long term success of dental implants. 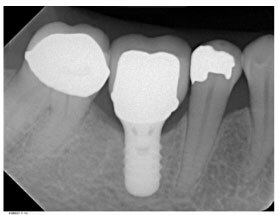 Because of the variables involved in dealing with human beings it is not possible to give any guarantees, however it would be reasonable to expect that an implant‐retained prosthesis would survive for a period in excess of fifteen years. As with natural teeth, regular check ups, cleaning and maintenance is important. Inflammation can develop in the surrounding gums and bone if dental hygiene is ineffective (peri‐implantitis). If left untreated peri‐implantitis can lead to the loss of the implant and possible the restoration. Occasionally porcelain or plastic on implant prostheses may chip, or screws may loosen. Generally these technical problems are quite manageable.